Kanye West stopped by "Jimmy Kimmel Live" Thursday night and the conversation ranged from President Donald Trump to West's TMZ interview where he said slavery was a "choice." Up first was the rapper's relationship with the president. Kimmel asked West if he "was ever concerned for [Kim Kardashian West] being alone in the Oval Office with Trump." Kardashian West visited the White House earlier this year to urge Trump to commute the life sentence of Alice Marie Johnson. "Well, he is a player," West smiled and replied. But the jokes stopped when West brought up the backlash he faced when he threw his support behind Trump a few months ago. 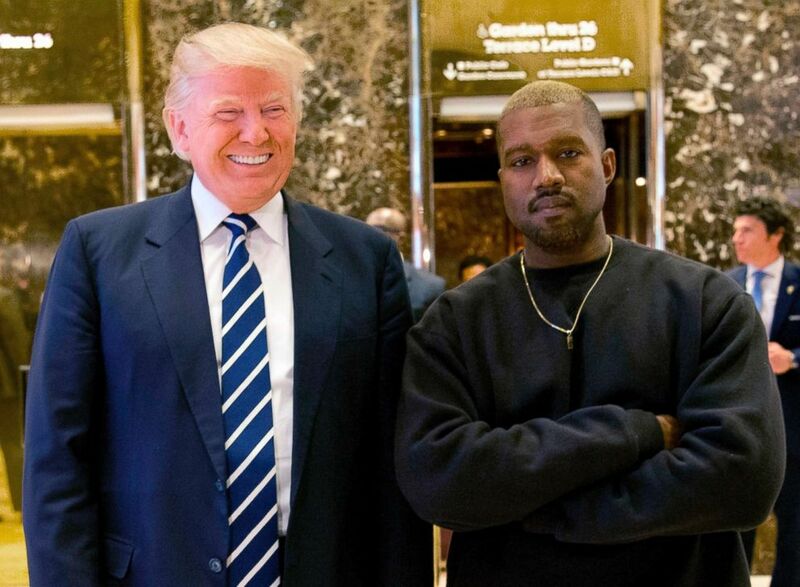 President-elect Donald Trump and Kanye West pose for a picture in the lobby of Trump Tower in New York in this Dec. 13, 2016 file photo. "It's funny in this world we live in, there are two main motivating forces," he said. "It's love and fear ... Just as a musician, African-American guy out in Hollywood, all these different things, everyone around me tried to pick my candidate for me." West said he couldn't publicize his support for Trump "or my career would be over, I'd get kicked out of the black community." But he decided to speak his mind "no matter what the consequences were." He also said his support of Trump wasn't about policies but about "overcoming fear ... you can't bully me." "If I can't be me, I can't be Ye and I quite enjoy when people are mad at me about certain things," he said. He explained that he wanted to try a different approach with Trump. "When I see people go at the president, it's like why not try love," he said. "For one person to stand up against all odds and just hug somebody, the way that Alice Johnson hugged her family when she got out of jail, one by one by one, we can diffuse this nuclear bomb of hate we are in." Kimmel interjected and brought up the families being torn apart at "the border of this country." "You so famously said, 'George Bush doesn't care about black people,' which makes me wonder, what makes you think Donald Trump does?" Kimmel asked. West had no response. He sat there in silence before the show cut to a commercial. Kimmel moved on to other topics, including West's admission that he's bipolar, an issue that's addressed head on in his new album. "I spent a year-and-a-half after I got out of the hospital ... just chopping up samples and it was very therapeutic, because I wasn't full Ye, I don't know if I'm full Ye now," West said. Kimmel said he thinks West embraces being bi-polar and that's just "one of those things that makes you, you." "Yeah, I think that's another one of those things, where people are like, 'How are you gonna talk about it?'" West replied. He said being bi-polar "drives more of how you really feel. It doesn't do an opposite [referring to the humorous phrase on his album cover]. I think it's important for us to have conversations about mental health, especially with me being black." West mentioned he had his "first complete blackout at age 5. My mom didn't fully medicate me because I might have never been Ye." "Almost like Turrets," he added. "There's some cases of bi-polar, where people go low, I go high." Earlier in the night he tried to explain those comments. "They keep us so focused on history till we actually believe it repeats itself ... and we can't advance as a race of beings," he told Kimmel. West was hospitalized in November 2016 for exhaustion and sleep deprivation, sources close to the rapper told ABC News at the time.